We'll be in Detroit for the Detroit Auto Show and, instead of preparing for the show this Saturday night, we'll be karting at Kart2Kart in Sterling Heights. Think you're fast? Come karting with us to find out. Last year our Travis Okulski took the top spot amongst journalists in a little competition sponsored by a German automaker at Kart 2 Kart and we thought we'd return on Saturday to get some practice before this year's event. Why not join your fellow Michigan-area Jalopnik readers, writers and some other journalists we like and put us in our place? Don't want to race? Just come and hang out, the sodas will be on the house for Jalopnik readers. The plan now is to do a Grand Prix-style event with a practice session, qualifying, and a race to determine who is the fastest of all. While we'll be providing the soda you'll have to buy your own karting session ($55). Maybe get there a little earlier than 7:00 PM this Saturday, January 11th to make sure you've got a slot. 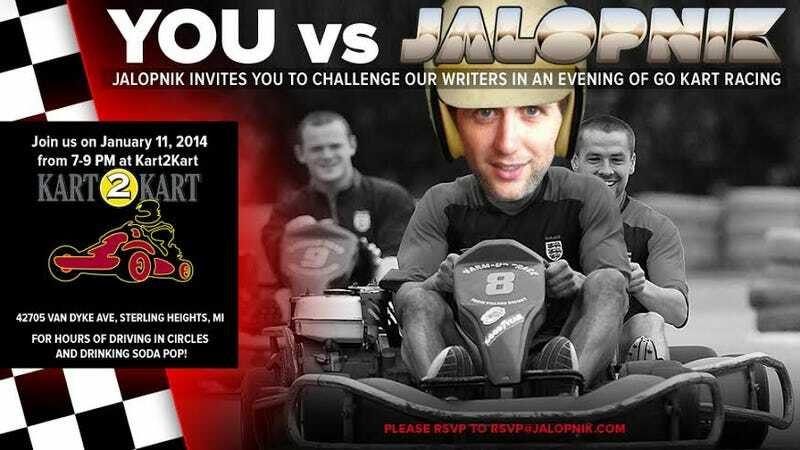 If you think you can make and want to race please RSVP to RSVP@jalopnik.com by Wednesday at 4:30 PM EST. If you're media, please also let us know. What: Karting with Jalopnik folks. What To Do? RSVP here.